Bulldogs are district champs; begin playoffs at Lindale. Kilgore, your Kilgore High School Bulldogs are district champions once again. And wow — what a way to win it. In front of literally a standing-room-only crowd of over 8,500 at R.E. St. John Memorial Stadium, the Bulldogs knocked No. 1 Gilmer off its perch, scoring with 1:38 left and then hanging on and sealing it with defense, capturing the District 16-3A championship with a resounding 34-29 victory. Kilgore, now 9-0 and finished with the regular season, will begin the Class 3A Division I, or “big school” playoffs, at Lindale next Friday night (likely against Van). 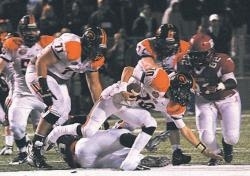 Gilmer (9- 1) will go into the 3A Division II, or “small school,” playoffs. The win ended a two-game losing streak to Gilmer, but continued one trend: the Buckeyes have never won in Kilgore. KHS leads the all-time series, 5-2.